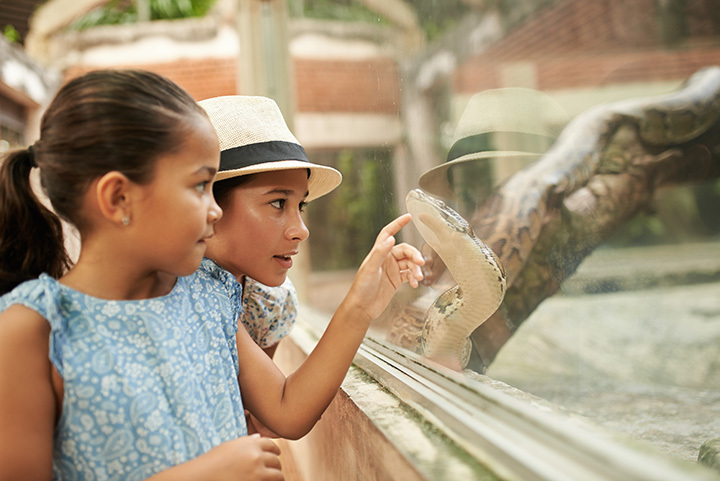 Dickerson Park Zoo connects people with animals to create adventures that encourage discovery and inspire conservation action. Adopted by the Springfield-Greene County Park Board, December 2010. The revitalization of Dickerson Park Zoo coincided with philosophical changes being experienced by zoos nationwide, and a mission recognizing the objectives of recreation, education, conservation and research was adopted and used as a guidepost for charting the growth and purpose of the zoo. A master plan, adopted in 1985, visualized a new zoo, utilizing geographic themes and phased development addressing the mission objectives as guiding concepts. The zoo became involved in several Species Survival Plans, most notably Asian elephants, maned wolves and cheetahs, finding success with each endeavor. In-house and outreach education programs became valuable services offered and used by the community, and fun, family-oriented special events drew large numbers and gained additional support for the growing zoo. The growth of tourism in the region also contributed to increases in attendance and offered visitors to the community another attraction when visiting the Ozarks. The zoo was accredited by theAmerican Zoo and Aquarium Association in 1986, and has been reaccredited in two subsequent reviews, most recently in 1996. With success comes expectations for additional services and exhibits, and the need for increased revenues for operation of the zoo. An update and revision of the master plan was completed in 1996, and efforts are underway to assure that funding, both private and public, is in place to enable the projects in the master plan to be accomplished by 2010. The zoo enjoys a positive place in the cultural fabric of the community, and all indications are that it will continue to be treasured as one of the city’s crown jewels.